An Apple patent filing uncovered on Thursday describes an advanced mouse that employs sensors to measure the level and location of force exerted on its main button, as well as haptics systems for providing feedback. 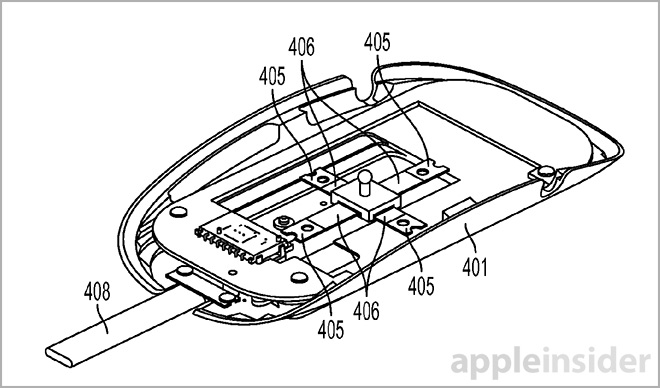 As published by the U.S. Patent and Trademark Office, Apple's application for a "Force Sensing Mouse" details a mouse peripheral that not only varies its output based on how hard a user presses, but returns confirmation feedback in the way of haptic vibrations. The invention is largely built around a strain gauge operatively coupled to a cantilever arm or beam. Employing the familiar Apple mouse design, with a single large top portion acting as a button or buttons, the accessory is able to easily and accurately transfer force through the arm, onto the sensor. For example, when a user presses down on the mouse, the cantilever beam may bend, flex or twist, thus deforming the strain gauge that in turn outputs a certain voltage to be translated into an input signal. By processing voltage output, the mouse can estimate the amount of force being applied by the user and generate a control signal accordingly. As for haptic feedback, an electromagnet is disposed in the mouse's body such that it hits the top button portion when activated. Alternatively, embedded vibration motors or other haptic systems are placed in one or more positions so as to provide adequate levels of feedback. In practice, a user moves a UI cursor over an icon an exerts a first force (button press) to select the asset, which triggers a preset feedback force. A second, harder level of pressure induces the execution of a command, like opening an app or folder, while the mouse responds in kind with a more intense vibration. In this way, the user is able to navigate, select and activate graphical assets with one button press, getting feedback along the way. Apple notes the pivot-style orientation of its mouse design might cause distortion in readings as less force is transferred through to the cantilever beam when a user presses down farther away from the pivot point, while more force is transferred when closer to the mouse's mechanical elements. To resolve this issue, and pinpoint finger location, the invention proposes deploying a touch sensor like the one found in Apple's Magic Mouse. Alternatively, different types of sensors —piezoelectric force sensors, force transducers, pressure sensor arrays, torque sensors and others —can be used instead of the cantilever beam/strain gauge setup. The use of multiple sensors or location tracking via multitouch provides even more flexibility and introduces what are perhaps the patent's most interesting embodiments. For example, with location tracking activated, the mouse's top portion can correspond to different locations on an operating system's UI. In another embodiment, a button press is divided into "left force," "right force" and "middle force" depending on where the user presses or where their fingers are when force a first force is exerted. Apple offers the example of a flight simulator that maps right, left or middle forces to a plane's directional controls (pitch, yaw and roll), while applied force corresponds to speed or amplitude of movement. Illustration of force sensing mouse with multiple cantilever arms (405). 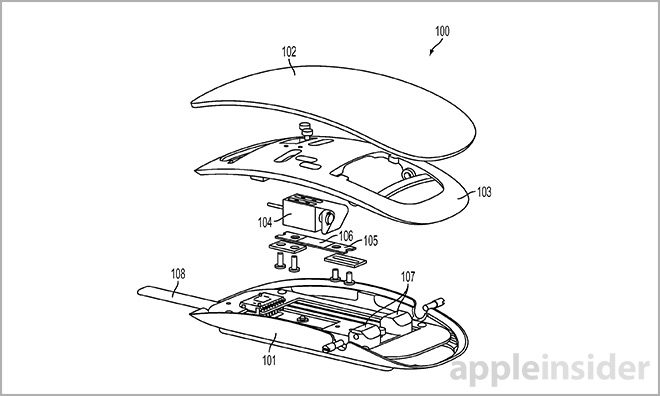 It is unknown if Apple is working on a new mouse device, though the existing Magic Mouse is nearly five years old. Apple's peripheral releases are difficult to predict, though the Magic Mouse replaced the preceding Mighty Mouse after the old multi-button version spent four years on the market. Apple's force sensing mouse patent application was first filed in 2013 and credits James E. Wright and Keith J. Hendren as its inventors.